your compass and courage as your guiding light. What happens to our broken dreams? Do they disappear into thin air? Or do they lie within us waiting for us to believe in them again? When was the last time we truly believed in a dream without fears or worries getting in the way? Perhaps we have been disappointed by our dreams. Because they always seem so far away, or because they didn't arrive at what we believe to be the right time. Perhaps we have been blessed to see our dreams coming true before our very eyes, and they make us dream even more dreams. It is also possible that sometimes we are not even aware enough to notice our dreams being realized because they arrive in a different package. And this is when we are asked to open our eyes more to see what lies beneath the surface. Some dreams can come true in the form of hard work and more responsibilities. Some dreams can also come true in the form of an unexpected offer that we feel reluctant to accept. Other dreams do not manifest because they are not in alignment with the highest purpose that we have for our life. Understand that ultimately, we will grow with each broken dream. And we will evolve with each unfulfilled wish. This doesn't mean that the universe is working against us. This simply means that there is still more learning to do. Perhaps our dreams are 'flawed' because they come from the ego. Which means that without those dreams coming true, we wouldn't feel whole on our own. Perhaps we feel afraid to look deeper into our dreams because we may end up feeling undeserving of those dreams. Whatever our story may be, this is not about whether or not our dreams will come true. But more about our own personal attitude towards life. Can we find the courage to keep moving forward? Can we learn to create again, using the wisdom that we've gained along the way? We have our dreams for a reason. To show ourself and others that we can create beauty out of our dreams. The beauty of finding a way to grow and evolve. The beauty of recognizing that we do have the power to breathe new life into our dreams. And from there, we can open more pathways to embodying more fully our heart, our mind and our most authentic soul. Happy New Moon Solar Eclipse! The Moon is conjoining Mercury, Neptune, the Sun and Chiron in Pisces, marking an extra intuitive and transformative New Moon in the sign of the Fish. With a Solar Eclipse happening at the same time, this becomes an amped up New Moon - almost like a Full Moon energy-wise. 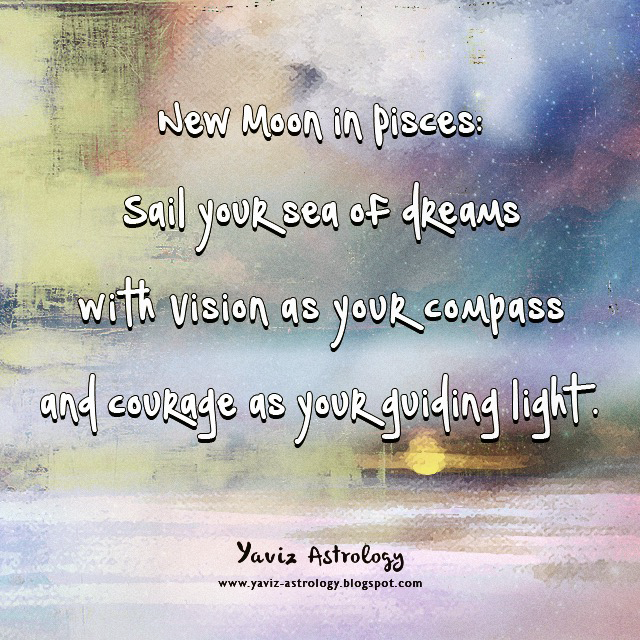 A New Moon Solar Eclipse in the sign of Pisces brings to the fore matters related to our dreams. What do we wish to manifest in the next two weeks? What changes are we willing to make in order to bring about new progress? A Solar Eclipse can sometimes herald changes that are beyond our control. But if we are open to the idea of evolution on a mental, emotional and spiritual level we can be more ready to welcome those changes on a physical level. Sometimes we need to let go of the old before we can open the door and greet the new. Changes, whether big or small, signals a new chapter in our life. Are we ready to turn over a new leaf? Are we willing to go to that next level of soulful transformation? The only way we can let new energy flow into our life now is by moving along with the energies of the universe. By not getting stuck on one page of our life, and by writing new stories that are more in tuned with our soul. Quiet our mind and listen to the gentle reassurance of our authentic inner voice - and not the judgmental voice of the ego, because that's not who we truly are on a soul level. Stay in a receptive state without worrying about the exact nature of our dream's manifestation, and remember to allow ourself cherish every moment of the journey. With the Moon forming a square to Saturn and an opposition to Jupiter Rx, there can be a tendency to over-analyze and focus on the negative. Shift our attention away from thoughts of worry and try to look at the bigger picture. Stay away from what might have been and try to look at what can be. As we see the future as a place for reaping harvest, we can see the present as a place for planting seeds and watering them. The same goes with seeing the future as a place for reaching goals. We can see the present as a place for implementing our plans and taking the necessary action steps to reach those goals. The Moon is also forming a sextile to Pluto, and we can channel this penetrating, intense energy into something creative. Something involving deep exploration of the soul can hold much interest. Whatever our choice of expression might be, try to use our imagination to look beyond the visible. Even planning sometimes requires us to have some strategic imagination. To be able to put aside old, tired ideas and beliefs we have and begin to actively rethink the way our dreams can be realized. Because what was strategic yesterday, may not be strategic today. Venus is still moving through the sign of Aquarius at the time of the New Moon, which is 12 signs away from Pisces. The idea of going away alone or with a loved one to a secluded place may fascinate us. Finding a place for quiet contemplation and self-reflection can be especially healing to our soul at this time. Pisces rules the 12th House in Astrology - aka the last House in the zodiac, or areas in life related to the subconscious mind, intuition, dreams, imaginations and faraway places. Use this Pisces New Moon period to take some time for ourself. To find someplace relaxing, perhaps near the sea, and to stay away from negative, stressful energy for the sake of our health and well-being. Believe that it is safe for us to dream with an open heart, because we always have within us our soul's bright light and love. It is time we let our dreams guide us towards finding the wisdom and courage to make changes that will lead us to a more authentic, soulful and empowering life.